This 'FPS' tab allows you to set the overlay FPS and FPS limit. Show/Hide Hotkey: This option allows the user to show/hide the FPS by using the hotkey. Position Hotkey: This option allows the user to change the position of FPS by using the hotkey. Show FPS Overlay: This option allows the user to show FPS (Frame Per Second) or not. Hotkey: This option allows the user to enable or disable the FPS limit by using the hotkey. Set FPS limit to: This option enables or disables the FPS limit option. 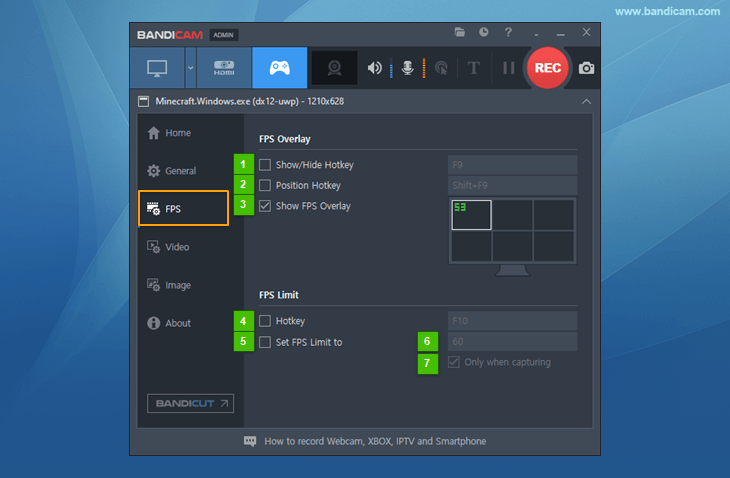 Only when capturing: When this option is checked, the FPS will be restricted only when the streaming video is being recorded. On the other hand, when this option is unchecked, the recording target is restricted by the FPS number. This [FPS] tab can be seen in 'Game Recording' mode, and it will disappear in 'Screen Recording' mode. FPS means "Frames Per Second". This FPS tab allows you to control the frames per second of the recording target.